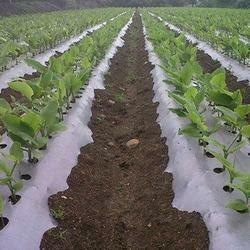 Mulching film is a part of organic, horticulture, and rituals agriculture process. Its made by LDPE material and gives lot of benefits and advantages to use. Its give more production, water saving, growth of plants, save money and many more benefits to farmer and end customers. Generally its run on micron wise from 20 micron to 150 micron used. As well as width wise from 2 meter to 6 meter width and standard 400 meter to 2000 meter length roll size. Before planting the seedlings, the beds of the fields are covered with Mulch Film and holes are made at desired spots, where the seeds are to be planted. The seeds are thereafter planted I the soil through these holes. 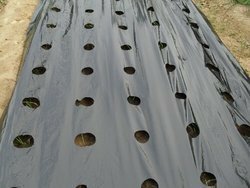 All the growth requirements for the seeds, such as light, ventilation and irrigation are fulfilled through these holes that are made in the film. Hence due to the restricted availability of light, the growth of the weeds is limited.The black coloring on one side of the film creates a rise in the temperature of the soil and enhances soil solarization.The silver color on the other side of the film reflects the solar radiation, hence helping to keep away certain insects from the crop. It is able to do this because the reflected light is too harsh for sensitive insect vision. 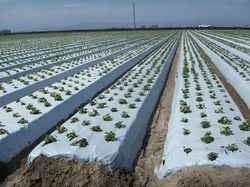 My Mulch is a LDPE UV Stabilized plastic mulch film for early season plant growth, development and early cropping. It is widely used by modern farmers in Horticulture, Agriculture and floriculture. Mulching is a process off covering soil around the plant root area with a view to insulate plant and its roots from the effect of extreme temperature fluctuations. Farmers are not getting what they are sowing. There is need to suppress weeds & conserve water in crop production. With the use of Drip Irrigation it makes advantage, because the temperature will be maintained in crops, water requirement as demanded, So that quality crops will be produce & farmer will get good price of their crops. We are a trustyworthy organization offering a wide a gamut of Black Silver Mulch Film. We are offering an excellent quality of Soil Solarization Film. For growth any type of plants require sufficient Sunlight. Herein role of Mulch films come. 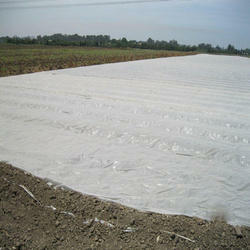 Before plantations of the seedlings the beds of the field are covered with the MULCH film – a black opaque plastic film. Than holes are made at the desired spots where the seeds planting is to be done. There after seeds are planted in to the soil through this holes. Light, ventilation, irrigation all the requirements of the seeds are fulfilled through this holes. Whereas other surrounding parts are fully covered with the Mulch film hence due to the light unavailability weeds growth is eliminated. Moreover with the advent of Co-extrusion technology that enables Multilayer films - BI-COLOR Mulch films are now made available. I.e. Both the sides of film are of different color. Thus various reflective phenomenon can be practiced. This Bi-Color MULCH films are also known as "REFLECTIVE MULCH FILMS". Silver/ Black; White/ Black Mulches repels certain insects due to its reflection specially in case of juicy fruits, thus maintaining quality and apperance of the fruits, which increases its commercial value. 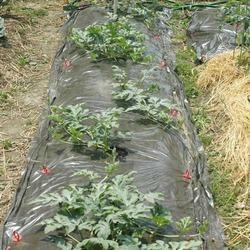 We are a trustyworthy organization offering a wide a gamut of Transparent Mulching Film. We are a trustyworthy organization offering a wide a gamut of Silver Black Mulching Film. We are a trustyworthy organization offering a wide a gamut of Mulching Film for Vegetable.